Bubinga wood is from Africa. It is considered one of the Rosewoods. It is a uniquely reddish brown color, a little heavier than other woods. 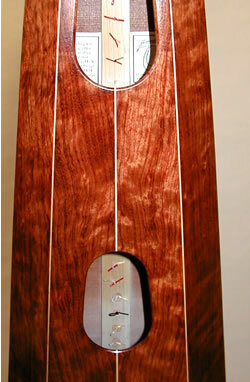 Bubinga produces a bright, clear, ringing tone with a lot of sustain, emphasizing the fundamental note. You can see the staved back soundbox with the maple trim down the back and around the top. 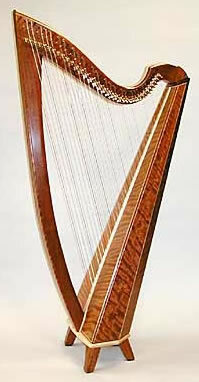 The front also has contrasting trim around the spruce soundboard with a maple string rib. This is a close up of the bubinga soundbox wood. The wood on the left is curly Bubinga and on the right is figured Bubinga. This is a close up of the top of the neck resting on the soundbox. The Piano pin block, which adds strength to the neck also adds an elegant contrasting color that accents the maple binding. 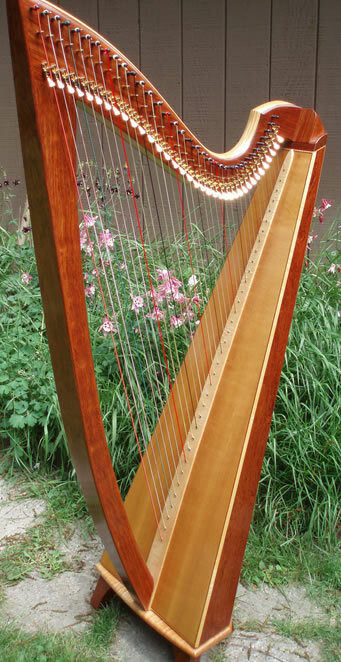 To make the harp neck, Dave takes a piece of wood and splits it down the center. He opens it up and puts the piano pin block in between, like a sandwich, with the bread being the harp wood and the piano pin block being the cheese. He glues it all together and there you have it. 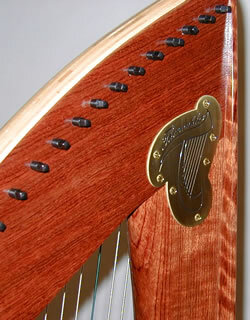 A gorgeous, strong harp neck. 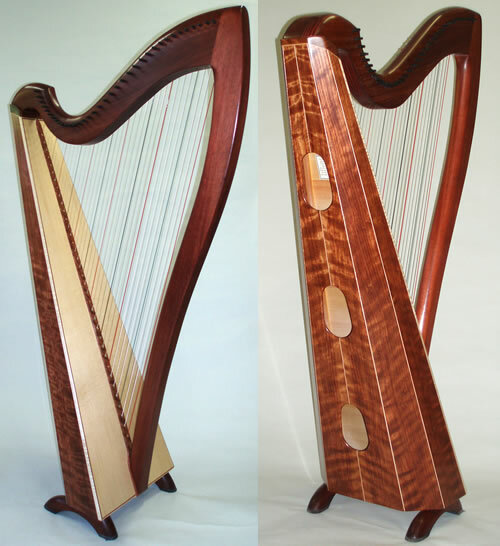 This Bubinga Cygnet has our standard Mahogany neck and pillar which greatly reduces the total weight of the harp. A Sweet way to go! 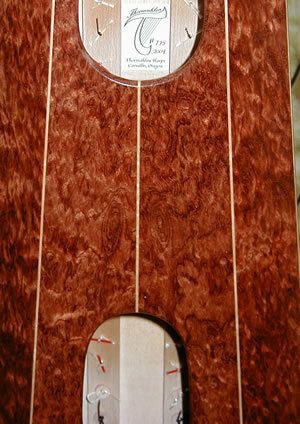 Some of the Bubinga woods above might be considered deluxe and there would be an extra charge for it. If you're interested in premium Bubinga, let us know. We can show you what we have by way of a private webpage. There is a $100 minimum for looking that will be applied to the price of your wood choice. Or go back to the models, woods or the instock page.